Indonesia is a popular tourist destination and Jakarta is the capital city of this beautiful country. 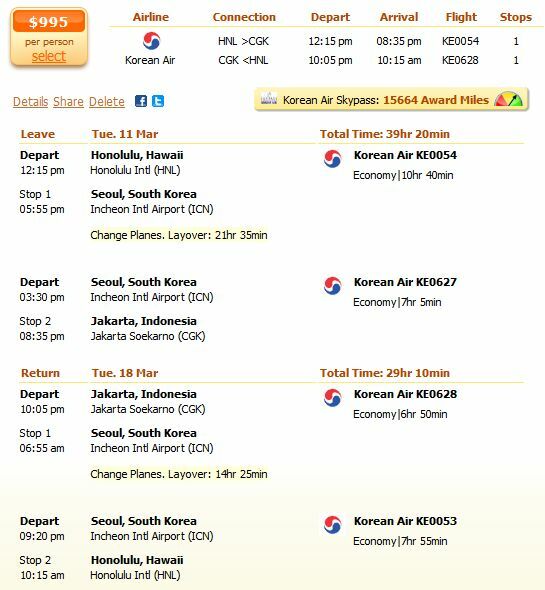 We found you a Jakarta flight deal with departure on March 11 and return on March 18. Book now the Korean Air flight from Honolulu to Jakarta from $995 and save 15%. The flight has one stop. If you want to be sure that this is the best Jakarta airfare deal, search for yourself in the box below between the offers of our partners. Maybe you will find a fligh that is better for you. If you have the time, check as many providers as you can to find the best price. You will fly from the Honolulu International Airpor (HNL) to the Incheon International Airport (ICN) in Seul, where you have a stop of 21 hours and 35 minutes. You have plenty of time to visit the city. On your way back you will also stay there for about 14 and half hours. From Seoul you will fly to the Jakarta Soekarno Airport (CGK). You can see this flight more detailed on the screenshot below. Let’s see some other flight offers for your trip to Jakarta. The next best price has the China Air for $1147. This means 15% more than the deal we presented. The United Airlines has tickets for $1214 and the Major European for $1352. When flying with the Korean Air from/to Americas you have two free bags of 23 kg (50lbs) and 158 cm (52 ins) each. For an additional baggage you pay $200, for a bag between 23-32 kg you pay an additional $100, for a bag between 32-45 kg you pay $200. An oversized baggage will cost you an additional $200.